The sun was out today which was great since we were on our way to Pagsanjan, Laguna to check out the famous waterfalls. After having to deal with a drizzle yesterday morning, this was good news. The drive down south wasn't much of a hassle since we left after rush hour. It surprised me that the traffic in Calamba and Los Banos wasn't as heavy as I expected in to be. We could have passed by the town of Pila on the way to Pagsanjan but we didn't have much time since it was nearing lunch. As we got into town, we saw large tarpaulin billboards from the LGU announcing that there was a standard rate for boat rides to the falls which was PHP660 per head. It also warned people to book their rides with resorts and inns. There were actually a lot of boatmen along the road pointing us towards the resorts. While taking photos at the Puerta Real of Pagsanjan, we were approached by several boatmen who pointed us towards a resort. Just like yesterday, they would board and accompany you there. We paid PHP660 each, which included the boat, life vests, and a toll fee which is shared by the municipalities of Pagsanjan, Lumban and Cavinti. An additional PHP90 per head allowed you to ride a bamboo raft that would take you behind the falls and back. But a "hidden" charge which the LGU should try to curb (or include in the standard rate at the very least) are the "optional" tips for the boatmen which aren't optional at all! I ended up paying PHP200 each after the trip (This was the amount which my friend Rhea told me she paid which served as my basis since the boatmen were saying tourists gave them US$45 each and said they would settle for even just half. Nice try). Anyway, the ride was fun. 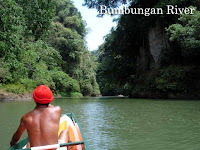 I have to give it to the boatmen, rowing the boat up the rapids of the Bumbungan River is indeed an art! It amazed me how the two boat men jumped out of the boat when the rapids came up and hopped from rock to rock pulling the small wooden boat upstream against the strong current. I would later learn that one must be licensed to do the job and a six-month training is needed before one can apply for a license. The trip upstream is about an hour while it takes 45 minutes to get back to Pagsanjan town. The forest on either side of the Pagsanjan Gorge was surprisingly virgin with so much flora and fauna. You could spot monkeys occasionally high up in the trees. During the rainy season, there are at least nine waterfalls in the gorge. 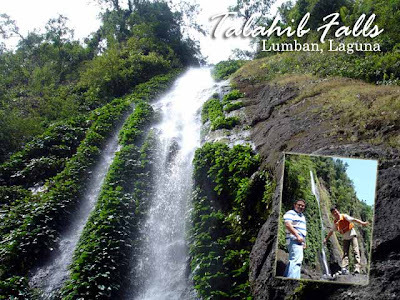 But during the summer months, many dry up and only two are left: Pagsanjan Falls and Talahib Falls which serves as a stopover point and rest area for the boatmen and passengers alike. After taking a few photos, we were off. 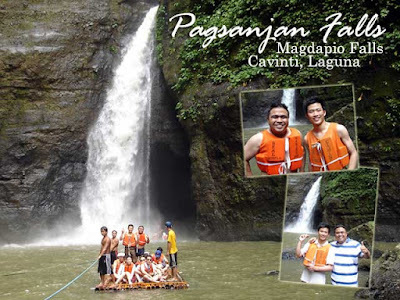 Several hundred meters away was the main falls which is more popularly known as Pagsanjan Falls. But its real name is Magdapio Falls. At the same time, it is located in the territorial jurisdiction of Cavinti and not Pagsanjan as most people would think. We checked out the bamboo rafts and it turned out we were unprepared for the fun! I expected we were going to get wet on the raft. But I didn't expect it was equivalent to taking a cold shower with your clothes on! Had I known, we should have worn beach clothing instead. Anyway, we solved that slight problem and boarded the raft. The experience was exhilarating since to enter Devil's Cave behind the falls, the raft was brought directly under the falls itself! The water was really cold and the experience made me feel like I was on a bamboo raft in the middle of a strong typhoon holding tightly to a rope so that I wouldn't fall off. Wow! Unless you are aquaphobic or claustrophobic, you should not miss the raft ride when in Pagsanjan! Anyway, the ride back was equally exciting since it was downstream and riding the rapids was indeed fun! The day wasn't over since we decided to complete the Laguna loop (trip around Laguna de Bay) for the rest of the afternoon. The one thing which has kept me from trying the Pagsanjan falls are the over agressive boat men on the highway. Once, we visited a resort in the town (we werent even thinking of doing the rapids!) when one of the boatmen suddenly jumped beside our car and started tapping on our window! Such HARD sell once wonders how this kind of tourism can sustain what otherwise is one of Luzon's most popular tourist spots. I hope it improves, thats the time I will take to the falls. @Lee, when will you tour us around Marikina? 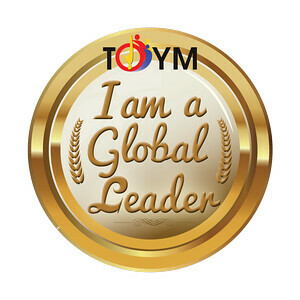 Did Toym's float win? @Tokayo, ok na siya ngayon since may fixed rate na. Tip nalang ang problema. @dodongflores, it's really fun. You should try it. Hi Ivan, did the boatmen stop in the middle of the ride to negotiate a tip? This is one of the things that i don't appreciate them doing. But doing the rapids and going under the falls is really a fun experience. Hey MJ! It's different this time. Before you leave the resort, the resort staff or whoever will explain to you what exactly you paid for and that the tip isn't included. I grew up in Pagsanjan. 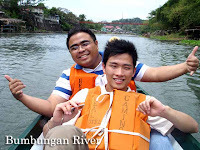 The boat ride going to Pagsanjan Falls was really fun. You will be amazed how “bangkeros” were able to carry the boat through the rapids and above those huge rocks. You will be thrilled to try the bamboo boat and experienced the strong water falls just like a full body massage. Its really worth to spend the weekends. i want i want! punta ako there (sana!) sa sat! :) pero, sana naman wala na yung tip tip na sapilitan..
hi ivan! 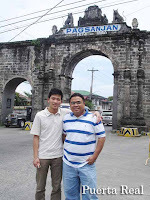 im planning to bring my american friend in pagsanjan. however we will be coming from paete side are there any resorts near the area where we can leave our car and backpacks so we can go "shoot the rapids."? thanks. what's the name of the resort where u took ur package from? 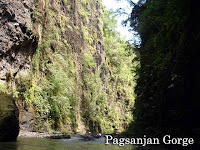 There are a lot of resorts in Pagsanjan. Just make sure they charge the standard rates. Since you'll have a foreigner with you, expect the tip hinting to be more aggressive. thanks for the reply. also what good camping sites do you recommend that's safe to go on an overnight stay. how about somewhere in caliraya? also in caliraya lake, is it easy to park your car and rent a boat to tour the entire lake? thanks so much for the reply. god bless. I'm not sure about camping there since I haven't tried it myself. Yes, I've heard of a campsite in Caliraya. You can also try the BSP Jamboree Camp Site in Mt. Makiling. In Pagsanjan, the best resort and hotel is La Corona de Pagsanjan Hotel. I don't recommend the Pagsanjan Falls for a foreigner. The boatmen are way too aggressive and if you take a boatmen on the road, they will often stop the boat near a canyon half way up to the falls and demand a large sum in order to continue the trip to the falls. You either pay or swim to the shore. I've seen it happen to other foreigners on the trip. Make sure to get a boatmen at one of the resorts away from the downtown to avoid the insanity. I blame the mayor of Pansanjan for the chaos that tourists experience there. I would never go back and I would never recommend it to a foreigner. The falls are amazing but the chaos and scams that the locals perpetrate against foreigners is not worth the time. I agree with the nuisance caused by the aggressive road-side flaggers on motorbike and the boatmen themselves! Our boatmen were requesting for 200 pesos each! It's such a high price for a local tourist. Unfortunately, this has been happening for such a long time. I don't think this will ever be going away soon. Though the Pagsanjan Falls trip was memorable, too bad it had to be ruined by their terrible behavior. The 200 pesos I was talking about was for the tips not the actual boat to and from Pagsanjan Falls which is 660 pesos. For my next visit to the Philippines, I shall have to review all your entries first as your experience and the comments of your readers would have been a big help during our last trip. We had two foreigners in our group of 4 which didn't help but yes.. we we were followed by a guy in a motorbike waaay before we got to the town proper. He'd knock on the windows showing some ID. We thought we were making our way to a resort but I think we ended up with some other group of bangkeros. Too late to change unfortunately. And yup, our two boats suddenly stopped in the middle of the ride to the falls and we were asked for a P500 "toll" for each bangka before proceeding. We didn't believe them of course but didn't want to be left stranded in the middle of the river so we paid up. Also coming back, there was another bangka that came up to ours trying to sell woodcarvings and other souvenirs. We really did enjoy our day but the endless haggling for money was a real downer. Did you go to a hotel? how much did you pay? and How about your other stuffs? Where did you put it? We left our stuff in the car. If you're taking public transport, you can leave it at the resort where you book your boat. one quick question, is that P200 tip for each person or for the whole party in your raft? coz what if there were 10 people in my party, then does that mean you have to tip them P2000? Maximum of three per boat. Two is just right. hi, we are going to plan a day trip to laguna and really wan to do the pagsanjan trip that you did... which resort did u go to for the arrangements with the bankero? can you jsut go to and resort? and yeah so P200 tip per boat right? 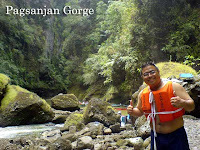 one of my friend a road biker told me that there is another way to pagsanjan falls. he told me that you dont need to take the expensive boat anymore all you need is to trek like 3-4km and then youll be at the front of the falls although i havent tried it yet. all you need to do is just look for a local who is not a relative of any boatman there and wallah. instead of paying 1000php per head if youre around 5 to 10 pax thats already 10,000php right so all you need to pay is 1000php for the guide fee only and thats it. So why settle to pay for a much higher fee with hidden charges when you can still enjoy the falls for a much cheaper and affordable price. Maybe because the boat ride is an attraction in itself? Yes, there is a route to get to the top of the falls and its been done a lot of times. But those who don't want to trek, or those who want to shoot the rapids would still take those boats.